Infographic - How does a community foundation work? Click here to download the Infographic "How Does CFGC Work?" Our professional staff has broad expertise regarding community issues and needs. We provide highly personalized service tailored to each individual's charitable and financial interest. Donor Advised Funds: We do the work. You get the credit. A Donor Advised Fund (DAF) is a charitable fund, advised by you and administered by the Community Foundation of Grundy County (CFGC). As advisor, you recommend grants to the not-for-profit causes you care about. We handle the investments and all the paperwork: tax reporting, receipts for your tax-deductible gifts, confirming the organization’s not-for-profit status, and preparing the grant checks. Donor Advised Funds are available for individuals, couples, families, and corporations. Contributions of cash, securities, or marketable real estate are the most popular, but other methods can be accepted upon review. Contributions made now can qualify for tax deductions immediately with distributions can be made later. Just remember that all contributions to your fund are irrevocable. Who can I give to? Gifts can be to local or national charitable organizations. The CFGC Board of Trustees must approve your recommendations, however we seek to honor your requests unless legally or practically impossible. Who chooses the fund’s advisors? You determine who will advise the fund and make grant recommendations – many donors bring the whole family into the discussions. You can also choose the asset mix for your fund – aggressive, moderate, conservative, or low-risk. We mail quarterly reports to you showing contributions, grants, and investment performance for the quarter. 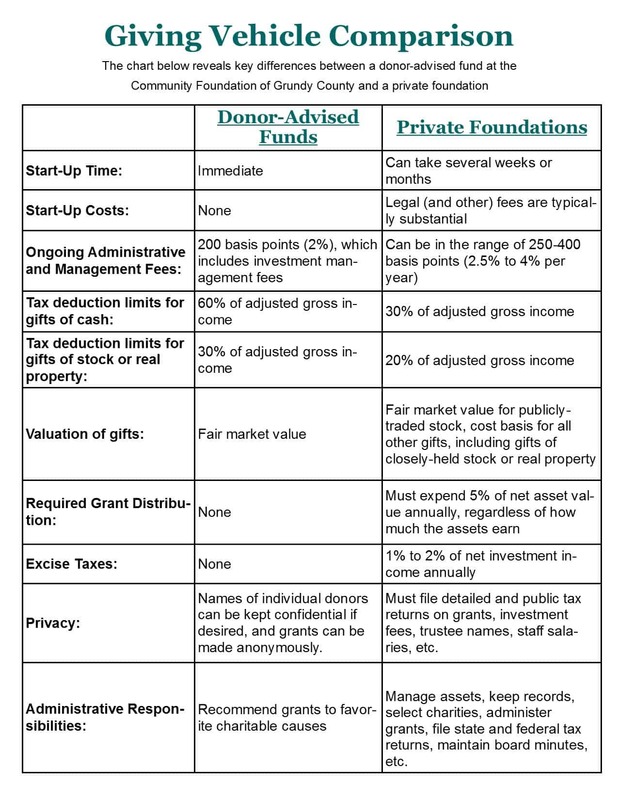 How does a Donor Advised Fund differ from a private foundation? A Donor Advised Fund is less expensive to establish and maintain than a private foundation. Donor Advised Funds are not subject to excise tax, do not have a minimum annual payout requirement, and do not need to file an annual tax return. In addition, you avoid any potential self-dealing penalties that may occur with a private foundation. The foundation support charge on funds stewarded at the Community Foundation of Grundy County is currently 2% annually. We pay fees to the investment firms who manage our funds and the remaining percentage stays in-house to support CFGC’s programs around early childhood care & education, workforce development, land use & protection, people in need, and growth & its impact on our systems. Can I get public credit for gifts? Absolutely. Unless you request anonymity, the Community Foundation of Grundy County will include your fund and its grants in our marketing and annual report. We do the work. You get the credit. Call or e-mail us at 815-941-0852 or info@www.cfgrundycounty.com. 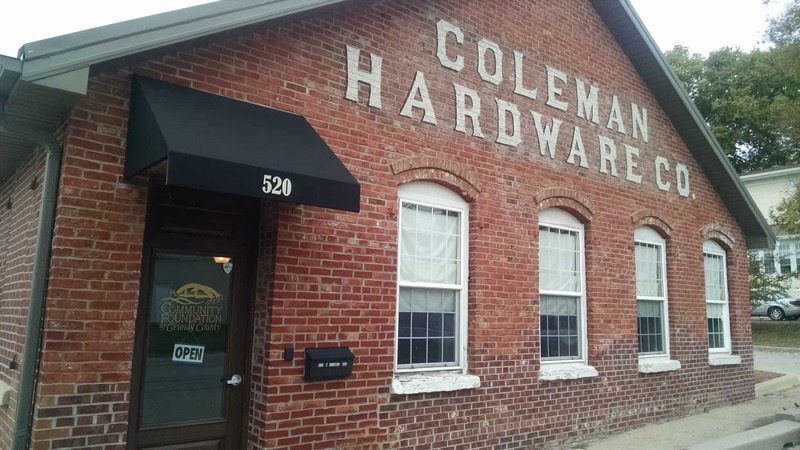 Our address is 520 W. Illinois Avenue in the historic Coleman Hardware Building in Morris, Illinois. Can be “corporate donor advised fund,” too. Donor can specify how the charity is to use the annual distribution. If so, supervised by Foundation Grants & Programs Committee to assure donor intent. interested residents establish a committee to raise and distribute funds for community projects and local non-profits. Donor (& family) cannot have majority decision power nor press undue influence upon the selection committee. Established by non-profits who want to build a long-term endowment to forever provide an annual income stream. Donors OVER the age of 70-1/2 can donate to charity directly from an IRA and that donation will NOT be taxed as income; your IRA administrator has to transfer the funds. Please note that IRA Charitable Rollovers CANNOT be transferred to a Donor Advised Fund. Whether a dollar amount or percentage, you can designate a gift to CFGC with instructions to deposit into a fund that your design now. Design now; fund later. Click here to download "Questions to Ask When Looking for an Estate & Charitable Planning Attorney"
We encourage everyone to dedicate just 5% of their estate to favorite charities. And if we can steward that 5% for you here in endowments to serve Grundy County forever, all the better! If you're stuck on how that might look, please click here to view a sample will taken directly from Jim & Carol Baum's will. You'll see how they've dedicated a percentage of their estate to various funds here plus the purpose of each fund. Your will doesn't have to be this complex, but you can see how we can help you solve even the most complex giving strategies! Easy step-by-step worksheets from "Inspired Philanthropy"
Tracy Gary, author of "Inspired Philanthropy," is a friend of the Foundation and we were thrilled to have her here a few years ago to present to an audience plus spend a intimate evening chatting with and challenging our board. We encourage you to use Tracy's book to guide you through your journey of discovering to see if, how much, and when to start a charitable giving plan. You can order her book from Amazon by clicking here. Or, we have purchased a supply and have them here at the office. You are very welcome to stop by and pick up a free copy! OR...maybe even better...the worksheets from Tracy's book are available for free from her website! 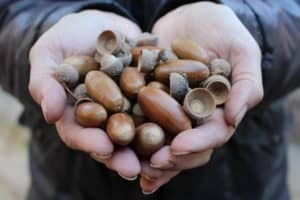 There are tons of resources out there to help you discover, plan, and implement your own charitable giving plan that fits you, your assets, and your lifestyle. We invite you to explore and hope that it leads you to designing a donor fund of your own here at the Foundation! Click here for our FAQ section. We can do this for you, too! Another friend's mother was ill and was spending weeks at a time in the hospital. That particular hospital kitchen staff came around patient room halls each afternoon with fresh-baked cookies, cold milk, and hot coffee. True, the patients often didn't get to partake, but in some ways it wasn't for the patients - it was for their families. Each afternoon the families shared some fellowship in the hall...a short respite to set aside their worries for a bit and re-charge their spirits over cookies and conversation. So as the friends were talking, the one said how much she appreciated this service of the hospital and while it's a rather small service, she hopes it never goes away due to budget cuts. "Endow it," said my friend. "Find out how much the cookie dough costs, then set up an endowment to forever fund the cookie dough. The hospital won't be able to spend it for anything else, even in the deepest budget cuts." What's your cookie dough? What do you hope never goes away? Can we help you endow it so that it always remains...regardless of future decisions and budget cuts? We know things go away...and often there's a good reason such as lack of participants in a program. But if money is the reason a program, service, staff, or nonprofit goes away, look for a way to endow it. Baums have endowed the Honors Night at Morris Community High School. Because that fund is here, the Foundation will always send a grant check to MCHS for this program...long after Baums and current MCHS staff have retired or passed on. Do you hear how universities have an "endowed chair of _____?" We can do that at local schools, too. If you want to make sure a particular subject is always studied, you can endow it. What about light bulbs? Your favorite charity cannot function without space, electricity, heat, air conditioning, desks, chairs, phones...the list goes on. If you endow one of these items, that's frees up other donor dollars for programs. Pretty much anything can be endowed. Think about it, talk with your favorite charity, then call us to make it a reality! all while getting a tax deduction! "When we plant a tree, we don’t plant it for ourselves but for our children." You can use this form to begin exploring a new donor-designed fund without making a trip to our office - although that's welcome, too! Endowed = principle is held in perpetuity and not spent; grants are made from income; Distribution Policy is currently 4% of a 3-year rolling average. Non-Endowed = income and principle can be granted down to zero. Select a name for your fund. It can be a family name or something anonymous such as "Apple Tree Fund." An issue such as "music" or "education" or a town name where the grantmaking will focus. Anonymous fund names are possible but we need to know the name of the donor(s) - which will be kept confidential upon request. Do you want us to partner with your attorney, accountant, wealth manager, or other professional advisor? If so, please list them here. Do you want someone to recommend grants from this fund after your lifetime? If so, please list them here. Successors can include spouse, children, grandchildren, organization, or committee - depending on the situation.